Ventreche, salt beef and some lomo. Two weeks since I returned from holiday and it’s been manic. What have I actually done? Well, to be honest I’m not sure. Suffice to say that when I sat in the armchair in front of tv last night that my eyes were drooping to a close within about ten minutes. I’ve done some processing, the usual bacons and sausages but I’ve also had a chance to play with a couple of new tests – that’s the beauty of the job, all I do is wake up and think, what shall I make today? I’ve been tweaking some cures, and I’ve got a bunch of hocks in as my test cases. I’ve also got Ventreche on the go, with a French named company it’s about time that I have a French bacon on the product list. 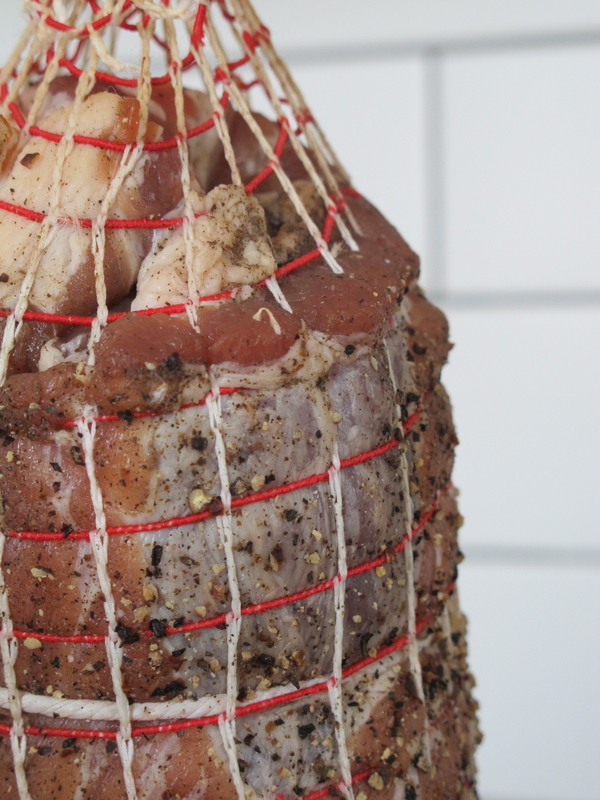 I’ve also diverted from the usual pork this month – I have some duck prosciutto on the go, and a couple of duck legs in salt ready to be made into confit. I also managed to pick up some beautifully marbled brisket from a 40 month old Dexter from Cig Lodor in Pembrokeshire earlier in the week. It’s been sat in cure for three days in an aromatic mix of cure, sugar, peppercorns, juniper berries and bay leaves. As usual, the brisket was barely out of the pan before I started picking away at it. I attacked a packet of Native Breeds pastrami last night too, I’d picked it up at the Spring Festival at the Royal Welsh Showground. If you see their products about, BUY THEM! 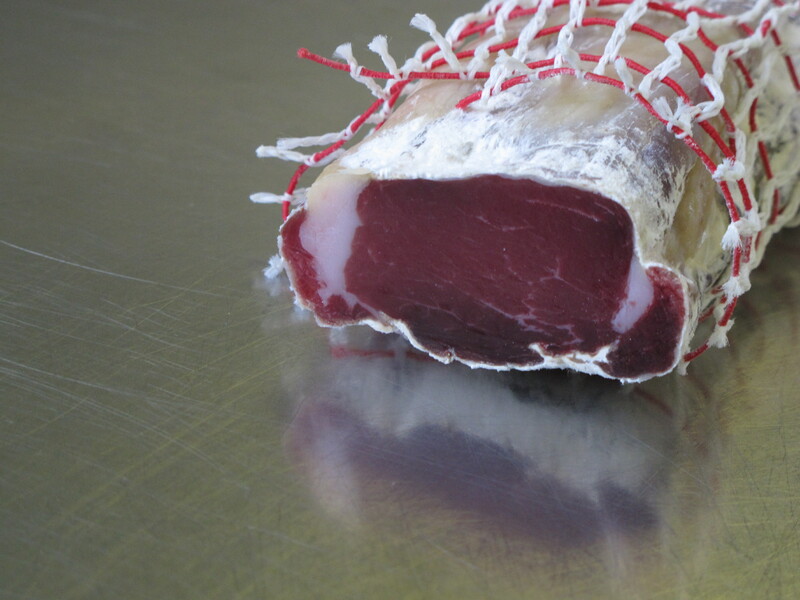 Honestly, it’s companies like Native Breeds that make me so proud to be part of a growing British charcuterie industry. I was at the festival to man the stall for the Wales and Border Counties Pig Breeder Association – an excellent day, speaking with breeders, producers and prospective pig keepers. I even met some charcuterie devotees, it’s always good talking shop with like minded people. Last, but by no means least is a smoked Polish sausage. We’re heading off to a Eurovision party next week. Each person is allocated an European country, and you’re expected to bring one food stuff from that country. I’ve got Poland, and rather than go out and buy something, I thought I’d produce some sausages. Hot smoking really is pretty new to me – I’ve used thermal processing ovens in the States (and can’t wait to get my own) but more basic rudimentary techniques using a Bradley Smoker don’t always provide such uniform results. However, that’s the beauty of playing around with things and experimenting. One last thing, and a quite important thing at that. After 14 months of product development, umpteen trials, cure tests and recipe tweaks I finally have some whole muscle cured products that I’m happy with. It’s been an immense leap going from home production, curing the way my forefathers have been doing for centuries, to the sterile environment of a professional production facility. As we’ve always produced seasonal products that have been largely defined by natural environmental conditions, it’s been an immense challenge replicating those in a controlled environment. But, we’re finally there. All I need now is a shiny new production facility. mmmmmm……mmmmmm….. your faggots are THE BEST! Happy to hear about your efforts and congratulations with your succeeding.